On a walk through Rainier Beach, Steve Scher finds an old Seattle neighborhood that’s trying to hold on in the wake of gentrification. 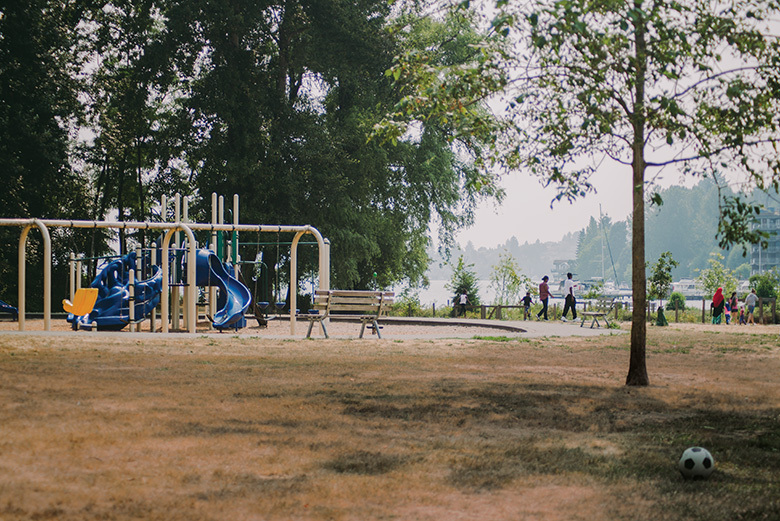 Rainier Beach residents enjoy the playground at Beer Sheva Park along Lake Washington. When you step off the light rail at Rainier Beach station, by Martin Luther King Jr. Way S and Henderson Avenue, it feels a little like the end of the line, a little windblown, as though this truly is the outskirts of a city. At this southern end of Seattle, the light rail squeezes in and out of the city between the two ridges that define the valley. Large trucks, junked cars and construction equipment are stored between the trees that populate the slope. At the outskirts of our booming metropolis, here is a place where it’s still cost effective to park luxury coaches, and tractor trailers. How long will that be the case? The Chief Sealth Trail, which crosses Henderson Avenue within a block of the train station, meanders 3.6 miles around the neighborhood, built on soil excavated during the construction of the light rail line. As I walk along here on an early summer morning, the trail appears popular with older men and women and young boys walking dogs. The energy that lights our homes and powers the 24-hour digital economy hums through the power lines overhead. It is an industrial landscape—part of the appeal of this neighborhood. Photograph by Ben Lindbloom. Kubota Gardens has always been a place of quiet respite for South Seattle Emerald founder Marcus Green, who grew up in the neighborhood. I follow the trail for about a mile and then the signs to the 20-acre Kubota Garden city park at 57th Avenue S. Kubota is the former nursery and home of horticultural visionary Fujitaro Kubota, an immigrant (like so many of the residents of this neighborhood) who came from Japan in 1907. By the mid-1920s, he was well known for working Northwest plants into Japanese garden designs. His home and nursery were a center for the Japanese-American community in the 1930s until he and his family were interned during World War II. They rebuilt the business after the war. Kubota is a favorite place of Marcus Green, the founder and editor of the online news site South Seattle Emerald, who grew up in Rainier Beach, surrounded by family. “As soon as you walk in, you are transported to another world.” He spent a part of his youth finding that sanctuary in the park. Throughout its history, Rainier Beach has seen its share of ups and downs. While new construction here lags compared with hot neighborhoods like Fremont and Ballard, now is another up time. Some residents worry that wealthier and whiter people able to afford the sky-high home prices that bedevil the region are moving in and changing the neighborhood. But the people who live in the neighborhood, Green says, are not yet ready to give in to gentrification. “The area still has its history.... It hasn’t been scrubbed away.” His personal history includes his first job, working on the taco line at the KFC/Taco Bell on Rainier Avenue, and buying church shoes at Payless Shoes, formerly Volume shoes. Julia Warburton, whom I encounter pulling weeds along an alley near Kubota, loves the neighborhood, too. She and her husband moved here about 10 years ago. “We got a view of the lake at good prices,” she says. These days, she sees houses snapped up as soon as they go on sale, then remodeled and resold at ever higher prices. Warburton, a nurse at Swedish Medical Center, worries that the people who have fought hard to improve the schools and the public spaces, and to create a safer neighborhood, will be the very ones displaced. A few blocks from Warburton’s house, down the hill from Kubota Garden, Cortez Charles is enjoying coffee at the neighborhood gathering place, Redwing Cafe on 57th Avenue, owned by longtime residents Anthony Campbell and Su Harambe. Charles no longer lives in the neighborhood—forced out by prices—but he’s still fiercely connected to it. A onetime gang member involved with violence on the streets here, he’s turned his life around and is focused on giving back to this community. Photograph by Ben Lindbloom. Power lines hum above the 3.6-mile Chief Sealth Trail, built on soil excavated from the construction of the light rail line. Winding my way through the neighborhood, I end up at the shore of Lake Washington, at Beer Sheva Park, just past the Atlantic Street boat ramp on Seward Park Avenue S and Henderson. Asmamaw Tabot, a taxi driver, is watching his two daughters run and play around the swings and slides. He used to live across the street, in the Lake Washington Apartments, and his daughters love to come back to explore the swampy shore of the lake and dream of becoming doctors. That’s the kind of spirit that Tabot and the others I’ve met on this walk want to keep in this neighborhood. Marcus Green says that people in Rainier Beach are fighting for a chance to preserve at least a bit of the status quo against the onslaught of wealth, rising prices and limited housing. The neighborhood may have modest economic roots, but is rich in other ways. Photograph by Ben Lindbloom. Gentrification has led to some businesses closing, but not the Seward Park Market, where customers can still buy fresh fried chicken. *Based on a census analysis of the population of the Rainier Beach Urban Village Demographic Area between 2009 and 2013 by the City of Seattle. Photograph by Ben Lindbloom. Though he no longer lives in the neighborhood, Cortez Charles, with his children, still has close ties to it, and spends many hours organizing community events and working with youth at the remodeled Rainier Beach Community Center (in background). The rainier beach story is the story of Seattle: periods of boom and bust and disruption—often linked to transportation. Native Duwamish families were the first to live here, but when Europeans flooded Seattle in the 1880s, in search of gold, coal, timber and fish, and housing was in high demand, some found their way to Rainier Beach. An interurban trolley began serving the area by the 1890s, and the neighborhood became a magnet for people seeking that elusive American dream: home, space, community. Italian and Japanese immigrants settled here, farming the cheap and fertile land. Jewish families moved into the area. Annexation to Seattle came in 1907. Trolley service faltered in the late ’30s when the car became preeminent, but Rainier Avenue—traversing through Rainier Beach—was the main highway connecting Seattle to Renton and beyond. The 1940s brought change. When the floating bridge across Mercer Island opened in 1940—offering easy access to housing in Eastside communities—the neighborhood became quieter. And during the war years, Japanese-Americans were forcibly removed from the neighborhood and imprisoned in camps. But war jobs at Boeing and the Port of Seattle brought new settlers. More African-American families moved into the neighborhood, attracted by the opportunities and because redlining by real estate agents and racially restrictive covenants kept them out of many of the region’s neighborhoods. Over the past decades, Mexican, Vietnamese, Filipino, Ethiopian and Cambodian families have settled in Rainier Beach. Now, the light rail line—once again offering good transportation between Rainier Beach, Seattle and beyond—promises another housing boom and another period of disruption. For now, Rainier Beach remains a diverse neighborhood. Whites are the minority. Fifty-eight percent of the population speak a language besides English. Families with lower incomes can still make their homes here. Preserving that ethnic and economic diversity is the goal for many Rainier Beach residents.